Is it me or is there a facial resemblance in the E-Trade commercial’s baby and the character in the film? I pondered briefly whether the character was the inspiration or catalyst for this creation, until I realized he was the creation of Marla Frazee, who based the character on the book of the same name. In this DreamWorks Animations 34th feature film, a very unusual baby must team up with an unsuspecting family member to save his company from the thralls of rival Puppy Co. and its CEO. Interestingly, the first trailer was released on National Boss's Day. Miles Christopher Bakshi, in his fifth film lending his voice, is Tim - a seven year old and an only child who is about to receive a baby brother. Watching from his bedroom window in horror as this little surprise package arrives via a taxi cab; looking every part a Wall Street tycoon. Sensing trouble, a plot develops to rid this diaper-wearing mogul from the household. 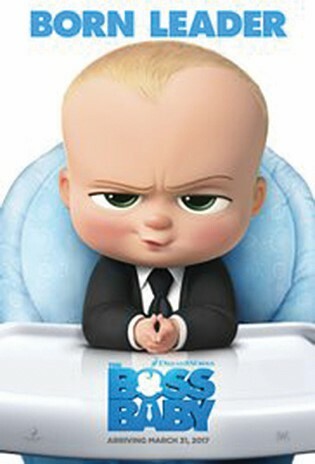 For Alec Baldwin, the voice of “Boss Baby” is a complete role reversal from what he physically plays in “30 Rock” and obviously one he embraced. His natural talent and character is spot on - delivering innuendos and subliminal messages. There are also a few parodies that adults will enjoy. Writer Michael McCullers (“Mr. Peabody & Sherman”) and Frazee have turned entertaining ink into emulsion; or what we now know as digitations. Director Tom McGrath (“Megamind”) also adds a nice touch to scene sequences and is no stranger to lending his own voice in several animated films, also lends his voice here as the TV chef. A full, well known cast of actors round out this menagerie of characters, one of which is Steve Buscemi (“Fargo”) whose voice you may recognize from (“Monster House”) Nebbercracker. “Friends” star Lisa Kudrow adds a touch of her familiar candor, dry humor sense of timing. Jimmy Kimmel as Dad is also himself. There is no deviation from either personality traits or mannerisms, which I found gave their scenes a recognizable touch of realism. Relatively new James McGrath, lends his voice to an Elvis impersonator with incredible accuracy. This was an added treat to an already hysterical plot. But, like most of the films by DreamWorks, it is the facial expressions of the characters that bring them to life. The dialog was icing on the cake.